Boltight Ltd, the leading manufacturer of hydraulic bolt tensioning equipment for the oil & gas, subsea, power generation, wind energy and industrial engineering sectors, is offering customers a quick delivery on all types of special tools. Most standard tools in the industry are based around the requirements of the oil and gas market and they are designed to suit standard flanges. 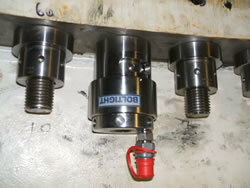 Boltight already has its Typhoon range to meet the requirements of high load applications and 10.9 bolting. Engineered for limited access applications, these tools feature the latest technology to provide easy piston retraction, long life operation and ease of maintenance. However, certain applications require additional features, perhaps manufacturing the tensioner with a special threaded section, a different puller bar or a cutout to clear adjoining nuts or weld bead. Boltight says modifications like these to its stock items can be turned around quickly with minimal or zero cost penalty. If an existing tool cannot be modified to meet a customer's specification, Boltight will design and manufacture equipment to suit. This can be supplied to fit any size of bolt and deliver any load requirement. The company has produced tensioners for bolts ranging in size from M8 to over M400. Designs are usually completed within a few days with production timescales dependent on the size of the order. Whatever the requirement, Boltight is committed to offering a fast turnaround. Explained Boltight Director Fred Heaton: "Outside of the oil and gas industry there is not the same degree of standardisation and specials are often required for working on wind turbines, one-off civil engineering projects, slewing rings and cranes. Here the applied loads on the bolts, the bolt materials, the space requirements and the duty cycles are all different. If a tool from our standard or Typhoon ranges is not suitable we would first look at modifying an existing component. If this is not possible we can design a completely bespoke tool." Added Fred Heaton: “Many customers automatically think the design and manufacture of a special tool is going to be costly compared to buying standards tools off the shelf. In many situations this is not so. Thanks to the efficiency of our state-of-the-art design systems and our extensive manufacturing resources we can often supply 'specials' at no cost penalty. What is more we can do this quickly to meet tight deadlines."